Stunning capture, congrats on your recent sale L/F. Pure perfection. What an awesome image! Gorgeous color and detail...congrats on your sale! Beautiful Work... Congrats on your sale!.....Carry On! Congrats on your sale, Janet! When I get some extra money I want to buy this photo in a frame. Its absolutely brilliant and amazing to capture such an irredescent creature in action. It's incredible how fast hummingbirds are, and how magical it must still be to have captured this image of beauty on film. Absolutely Gorgeous. Great work! What is that they say? Something about time and place. Well you were at the place and the time for this shot. You did not miss a beat either. What else can I say.... Everything about it is so good. A superb hummingbird shot ! What an unbelievable shot! This photo has it all...action, color, etc. Congratulations on your sale! Many blessings! Wow! Fantastic shot! Congratulations on your sale!! Brilliant capture, beautiful colors. Congratulations on a job well done! How beautiful! What a great picture! Congratulations! Wonderful capture - outstanding color! Absolutely amazing photography. Incredible that the motion can be stopped like that. Exellent!!! Congratulations on your sale. Beautiful, beautiful beautiful! Congrats on your sale! Nice bird! Congratulations on your sale, Janet! A Broad-bill Hummingbird searching for nectar. Taken near Tuscon, AZ. 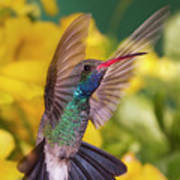 The hummingbird is the smallest bird and also the smallest of all animals that have a backbone. 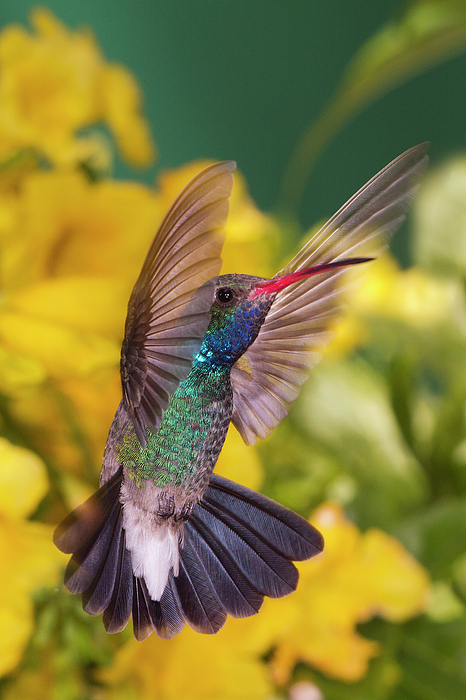 Hummingbirds can beat their wings up to 80 times a second during normal flight. 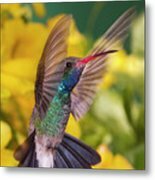 A hummingbird has a heart rate that can reach up to 1,260 beats per minute. Taken with high-speed flash units.